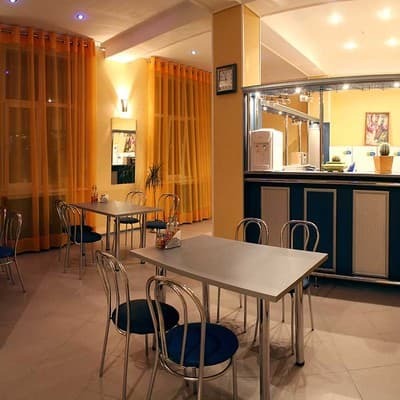 The hotel complex "Prestige" is located in a quiet area of ​​the city, above the street. Moscow (the central street of Yalta). 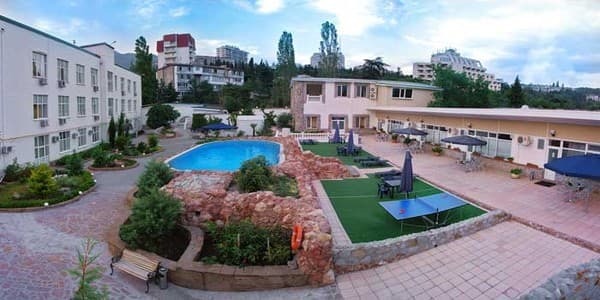 The complex offers a beautiful view of the Crimean mountains, Ai-Petri and Yalta. For those who want a more secluded holiday, there are separate cottages. On the territory of the complex are: outdoor swimming pool 16x8 m with countercurrent, sunbeds, umbrellas, adjoining recreation area, cafe, table tennis, playground, barbecue, gym, massage room, solarium, beauty services, guarded territory and parking, various baths - Russian and Turkish, saunas (Finnish and infrared). Free Wi-Fi Internet is available for guests. To the sea - 25 minutes walk. PRICES MAY CHANGE, IT IS REQUIRED TO RECEIVE INFORMATION FROM THE OPERATOR. Description of the room: Single rooms. A bathroom, a mirror, hot and cold water constantly. Double bed, large wardrobe. It can accommodate 2 people. 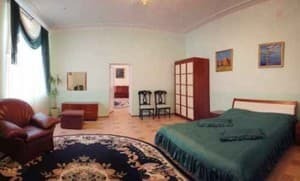 Double accommodation - 680 UAH. Description of the room: Single rooms. A bathroom, a mirror, hot and cold water constantly. Double bed or sofa bed with soft mattress, large wardrobe. Description of the room: Single rooms. Bathroom (shower or bath), mirror, hot and cold water constantly. Double bed, large wardrobe. 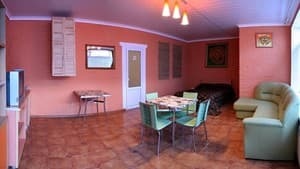 Description of the room: A cozy cottage with everything necessary for a comfortable stay. Description of the room: Bedroom - double bed, bedside tables, large wardrobe. Living room - sofa, coffee table, TV, air conditioning, refrigerator, el. kettle. Bathroom (bath), mirror, bathrobes, hairdryer, hot and cold water constantly. Description of the room: Spacious two-room suite. Bedroom - double bed, bedside tables, TV, large wardrobe. Bathroom (bath) - mirror, bathrobes, hair dryer, hot and cold water constantly. Description of the room: A spacious 3-room suite with all the necessary attributes for a comfortable stay. Доброжелательный персонал, чистый и ухоженный отель. Гостиница нормальная. Понравился приветливый персонал и чистые, комфортные номера, а также, то что каждый день в них делали уборку. Не понравилось месторасположение гостиницы, очень далеко до центра города. The cost of additional space 150grn. The hotel complex "Prestige" is located in a quiet area of ​​the city, above the street. Moscow (the central street of Yalta). To the sea - 25 minutes walk. By car: driving to Yalta on the street. Kiev, following the bus station before the first turn to the left, turn and cross the canal to the bridge on the street. Moscow, on it about 30 meters before the first turn to the right, go to st. Dzerzhinsky, further up (about 300 m) to house number 17 on the right side (a large white three-story building). By bus: while at the bus station go to the street. Moscow and moving along it (about 100 m) in the direction of the city until the first stop "October", turn left, on the street. Dzerzhinsky, climb up to house number 17 on the right side.